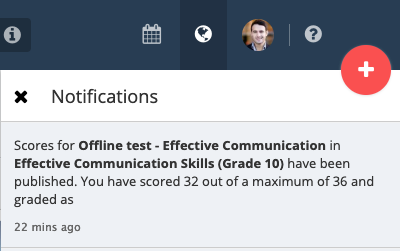 An offline test is a type of assessment that learner takes offline and whose score is recorded on Teamie. 1. Click the global Add (+) at the top-right corner of the page. 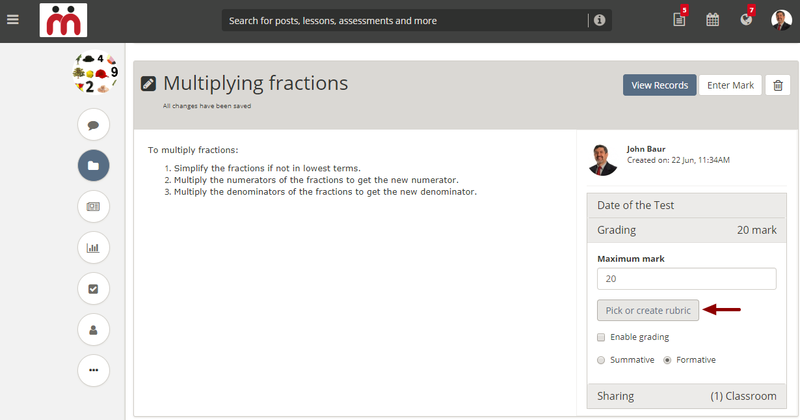 You can add an offline test from any page by just clicking "+" icon. 3. Type in the Title and enter maximum mark of the offline test. 4. Click Classroom drop-down and select the classroom in which you wish to share the offline test. 5. Click Section drop-down and select a section of your choice. The offline test will be created and placed at the end of the selected section. 6. Click Create and the offline test will be created shortly. 7. Once the offline test is created, you will be redirected to the classroom's materials listing page and you will see that offline test in expanded view. 8. Add instructions to the offline test. 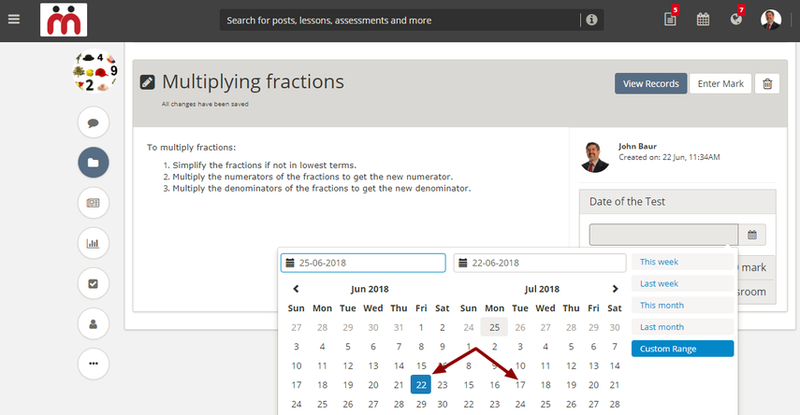 These instructions will be shown to the learners on the offline test landing page before the learners start working on the offline test and submit their work report to the instructor offline. 9. Select offline test's start and end date from the date picker. 10. Click Grading to expand the block and configure the grading method. 11. Click Pick Assign or create rubric. 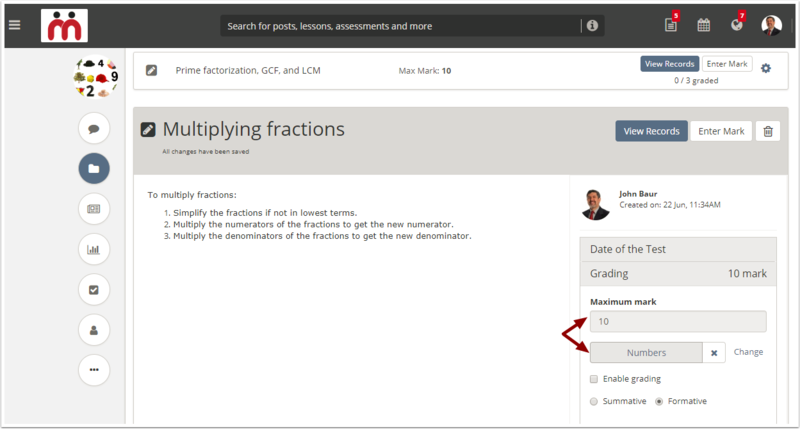 You can also change the maximum marks for the offline test from the Grading block Maximum mark section. 12. The rubric listing page opens. 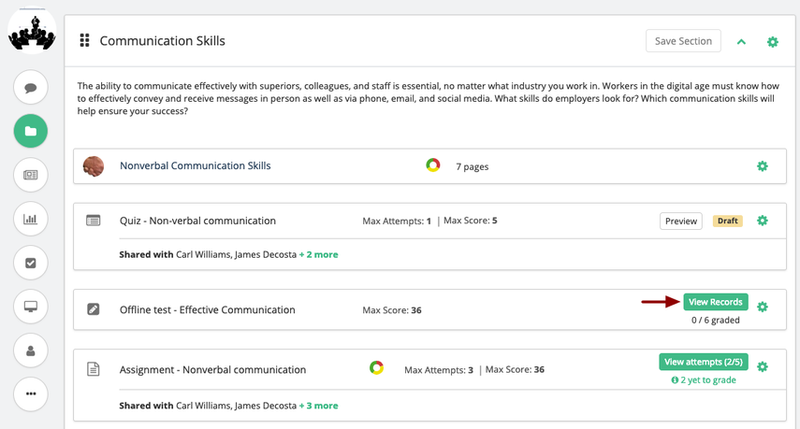 The globe icon shown next to a rubric title indicates that the rubric is shared to the rubric bank and can be used by other instructors on Teamie platform. 13. Search for the rubric you wish to map to this offline test. 14. Click View Details icon next to the rubric title to view its description and scale. 15. The rubric description page opens. 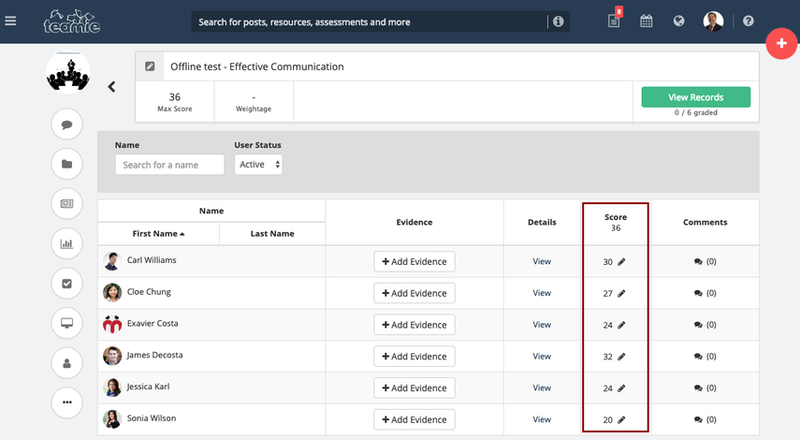 This page also shows the list of assessments where it has already been attached. 16. 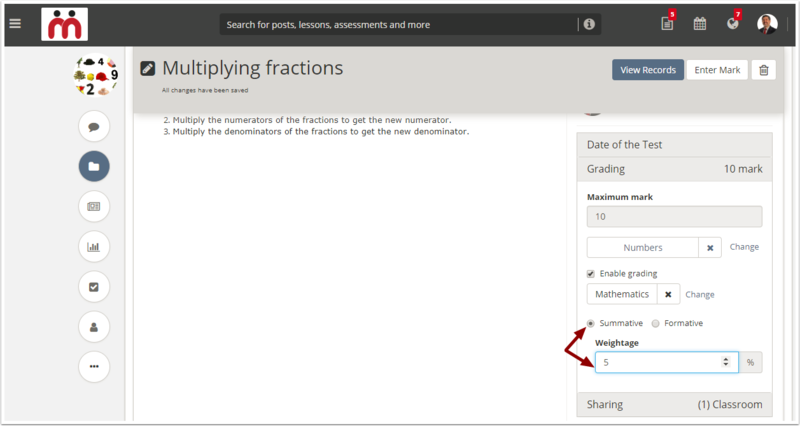 Once you find the rubric of your choice, then click Attach to attach the rubric to the offline test. 17. The selected rubric will be mapped instantly and the offline test's maximum score will be overridden by the rubric's maximum score. 18. 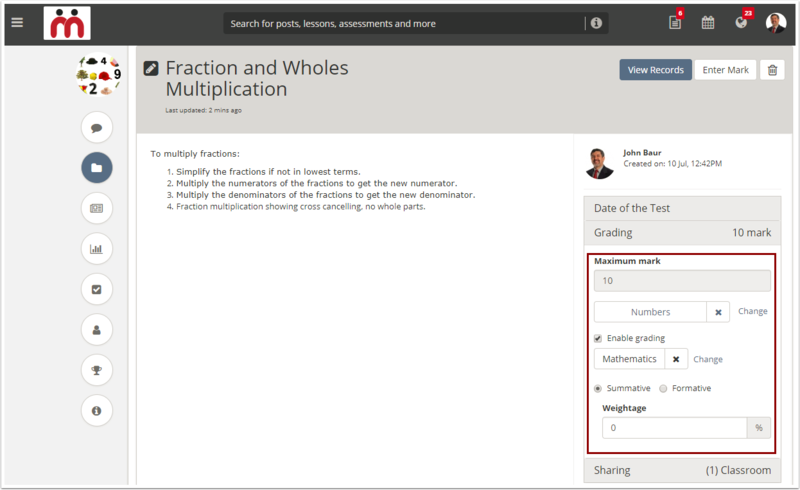 Tick the Enable grading and then click Set grade scheme to set a grade scheme to the offline test. 19. The Grade scheme listing page opens. Search for the grade scheme you wish to map to this offline test. 20. 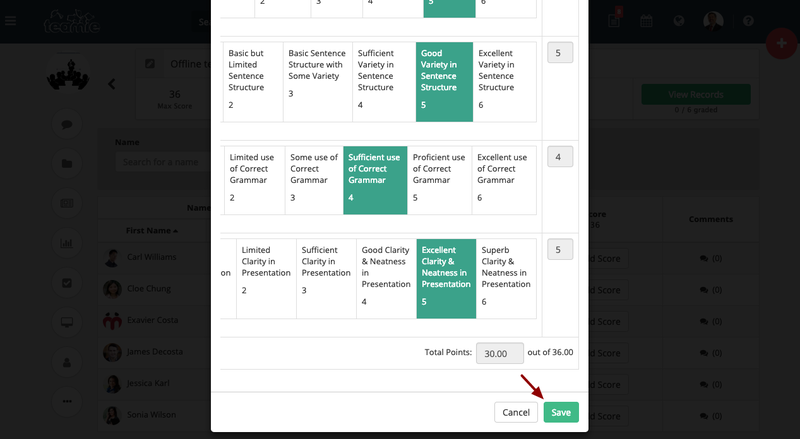 Click on the grade scheme name to select and then click Set grade scheme. 21. A success message appears to confirm that the selected grade scheme has been set successfully. Click "X" to remove the mapped scheme or click Change to replace the previously attached grade scheme as denoted by point 1 and 2 in the following screenshot respectively. 22. 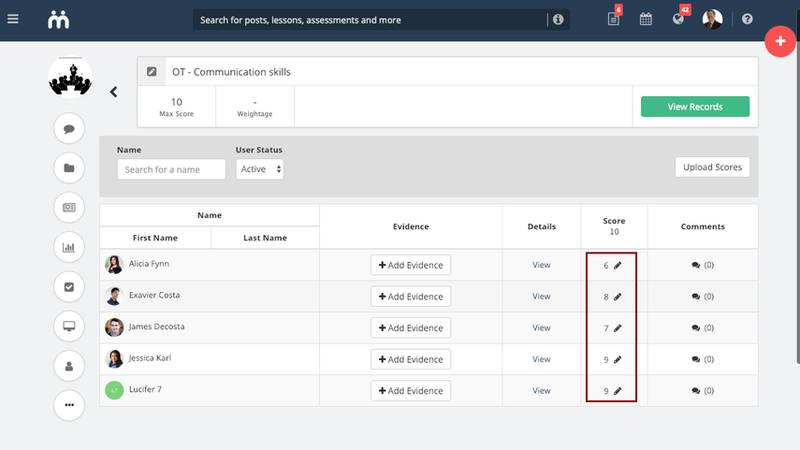 You can set the offline test grading typing (Summative or Formative) to grade each learner's offline work. 23. Tick the Summative radio button and enter weightage. Summative quizzes are used in order to evaluate learning at the culmination of a unit by comparing it against some predefined standards. An example being a final project or end-term examination evaluation. It is possible to have a summative assessment considered for evaluation, but with a weightage of 0%. In case, you wish to set up an offline with formative grading, then tick mark Formative radio button. Formative assessments on the other hand are used to monitor learning and provide ongoing feedback. This helps an instructor to develop a better learning plan for helping their learners. An example being a mid research proposal for early feedback. 24. 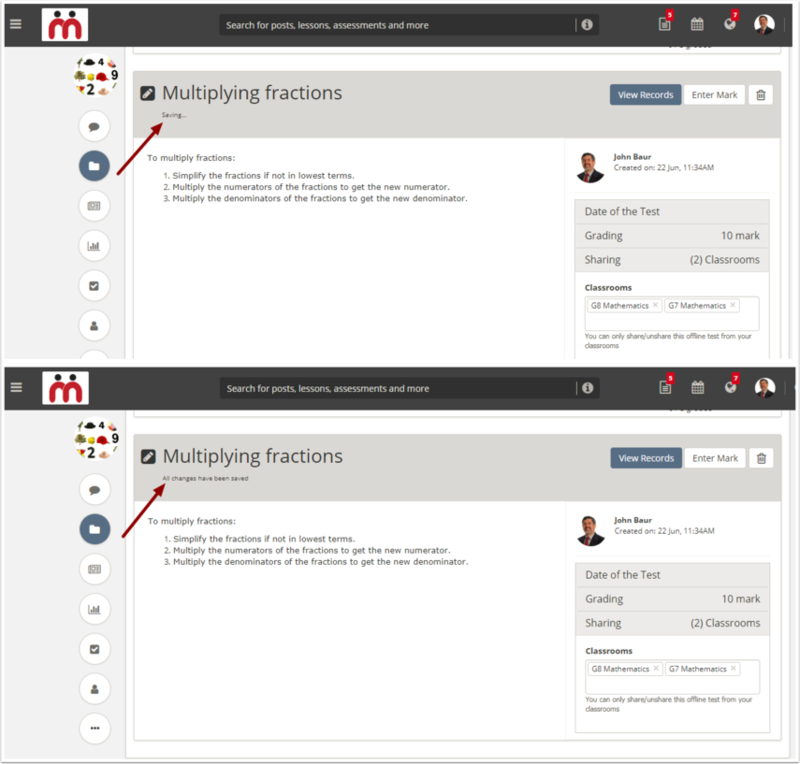 Click Sharing block to share the offline test with your multiple classrooms. 25. Clicking the Classrooms drop-down will list all the classrooms you are member of. Select the classroom that you want to share the offline test with. 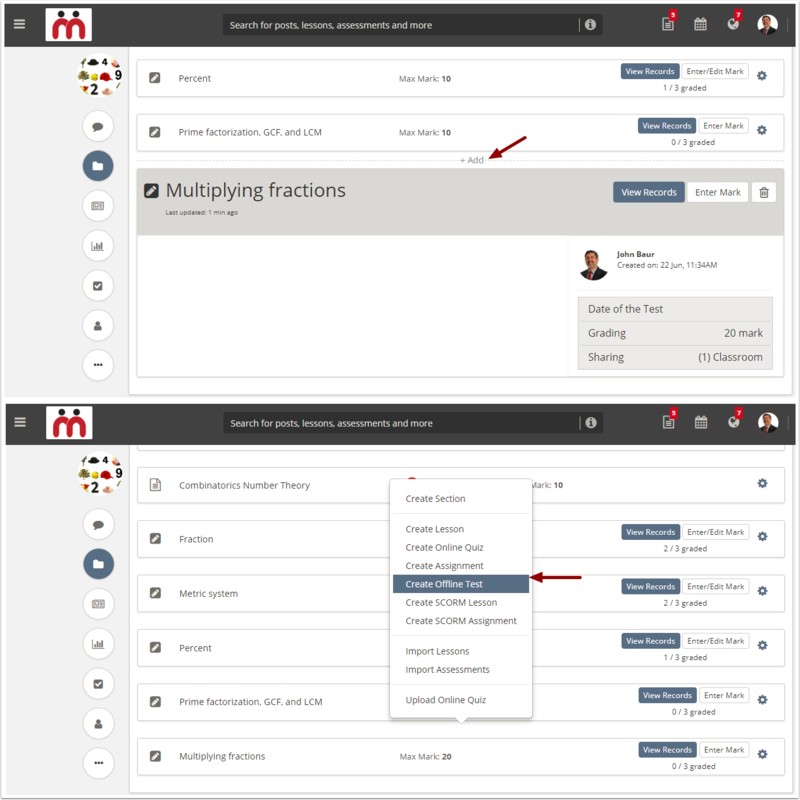 Similarly, you can select multiple classrooms to share your offline test with. 26. Here, we have shared this quiz with two classrooms. 27. Any change made to the offline test will be auto-saved. 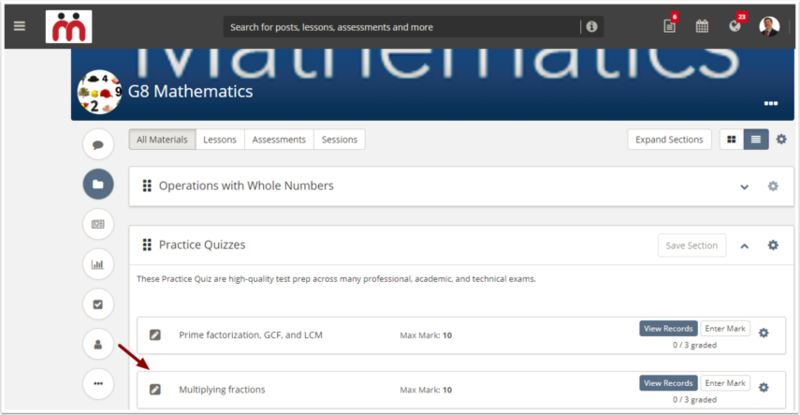 You can also add an offline test from the materials listing page of a classroom. 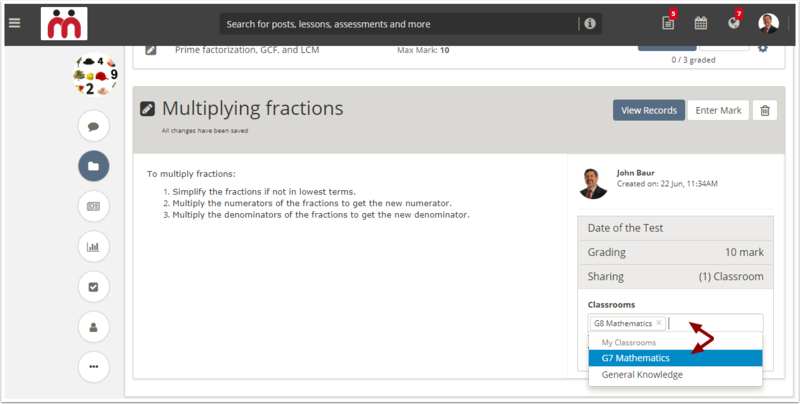 On the Materials page, you have the freedom to add a new offline test at any desired location. For example, it can be at the top, in between two resources or right below the last item, a +Add link gives you the flexibility to add an offline test at the corresponding location. 1. Go to classroom's materials page and click on the Offline test you want to edit. 2. The moment, you click on the assignment, it would open in the expanded view where you can make the changes you wish to make. 3. You can change offline test title and update its description text. 4. Your changes will be auto-saved. 5. Click Date of the Test block to expand and change offline test start and end date. 6. The Grading block allows you to configure the offline test score settings. 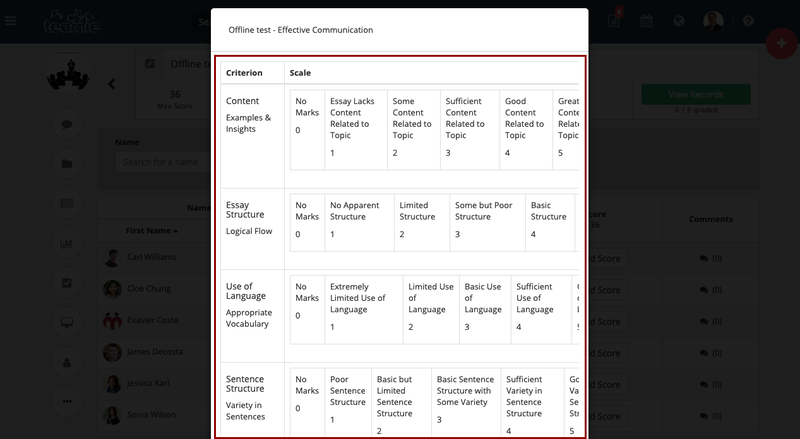 You can define offline test grading typing (Summative or Formative) and map grade scheme and rubric as well to grade learner's submission using predefined grade schemes / rubrics. 7. Similarly, the Sharing block allows you to share the offline test with one or more classrooms. 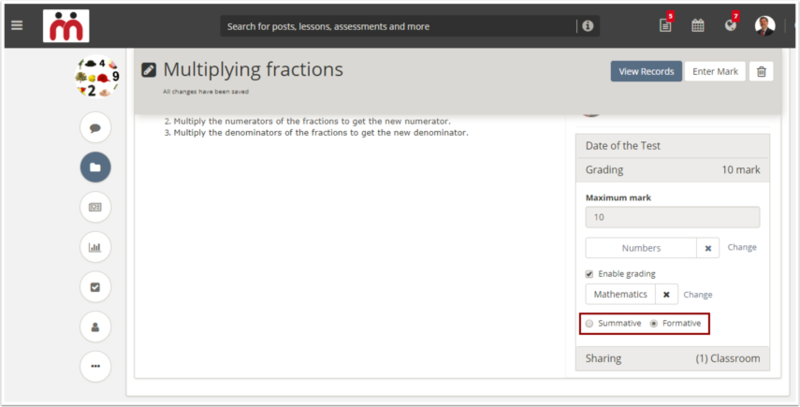 You can also unshare the offline test from any classroom(s) it is shared. Although, keep in mind the offline test needs to be shared with at least one classroom. 8. Your changes will be auto-saved. 1. On the Materials listing page, click View Records next to the offline test in list view. You will also see View Records button in card view and offline test's expanded view. Accessing View Records page of an offline test from its card view. Accessing View Records page of an offline test from its expanded view. 2. Click + Add Evidence next to the each learner to add evidence. 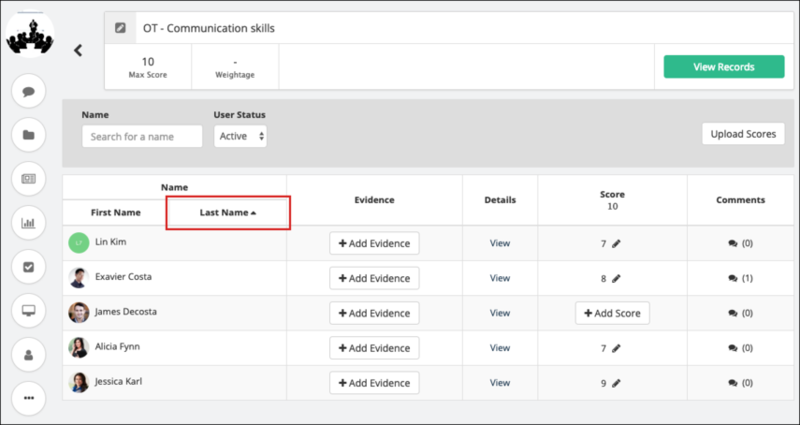 Here is a complete list of files which you can upload from your local system as an evidence to each learner's work and then grade their work on Teamie accordingly. 3. Select the document(s) and then click Open to add the documents as an evidence for the selected learner from your system. Note: You can attach multiple documents too. 4. Adding Evidence process starts. 5. A success message appears stating that the evidence has been added for the learner successfully. 6. 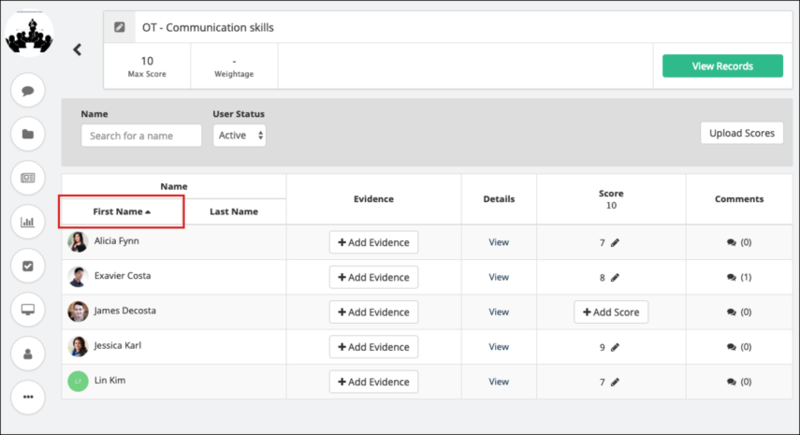 Repeat step 3 to add more documents as evidence for the remaining learners as per your requirement. 7. 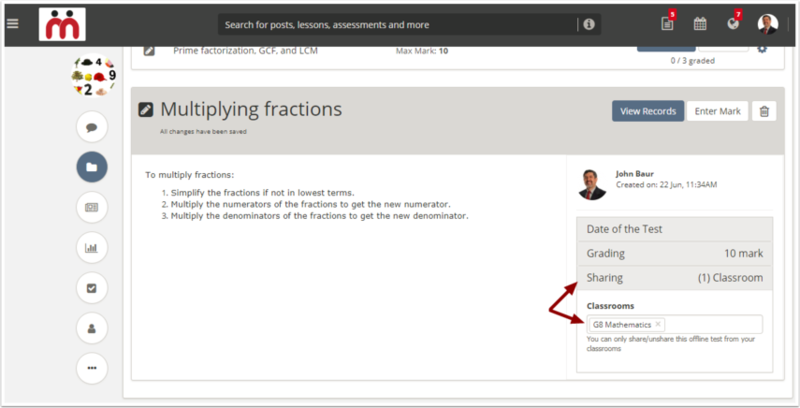 Click View link next to the learner's name to view the uploaded evidence file(s). 8. The learner's view submission page opens. You can go through the learner's submission and grade it. 9. 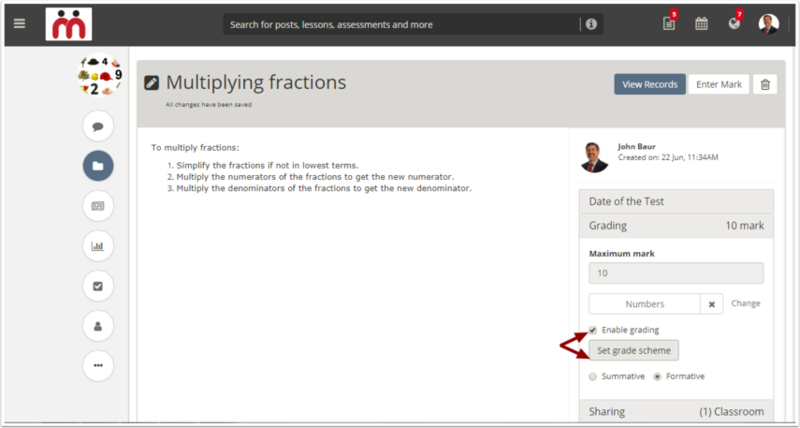 In case, you have uploaded multiple files for a specific learner, then system will display those in different tabs to show each uploaded file separately. Click the particular tab to switch and view the other files' content. 10. You can go through the learner's submission and grade it. 11. You can also add an evidence while viewing an individual learner's file submissions by clicking + Add Evidence provided at the top right corner. 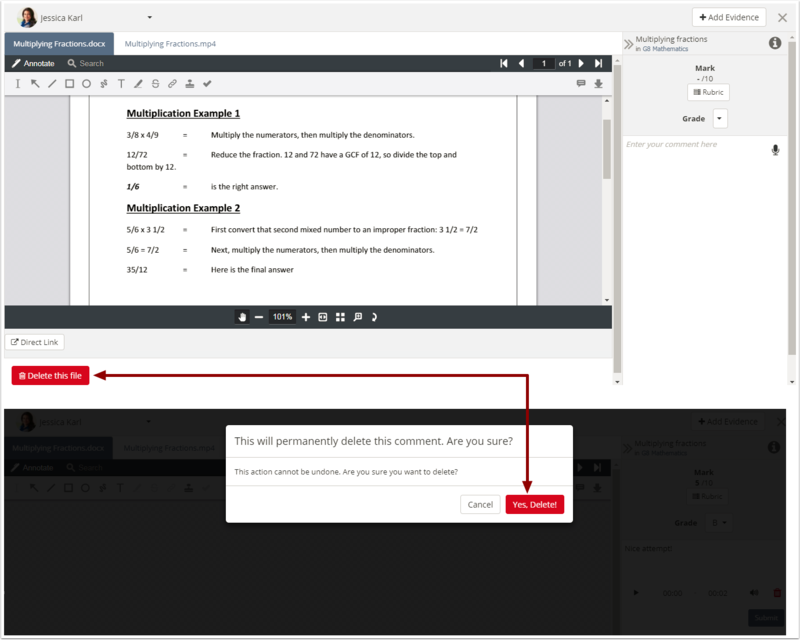 You may also add comment (textual / audio) to the learner's submission while grading. To add an audio comment, click the microphone icon and record your feedback. 12. To add textual feedback, enter text in the Enter your comment here text box and then click Submit. 13. To remove any file submission, click the Delete this file at the bottom left corner and then click Yes, Delete! to confirm and the selected file will be deleted permanently. Click Cancel to abort. 1. On the Materials listing page, click View Records of the required offline test. 2. Click +Add Score for the learner whose score you wish to assign. 3. 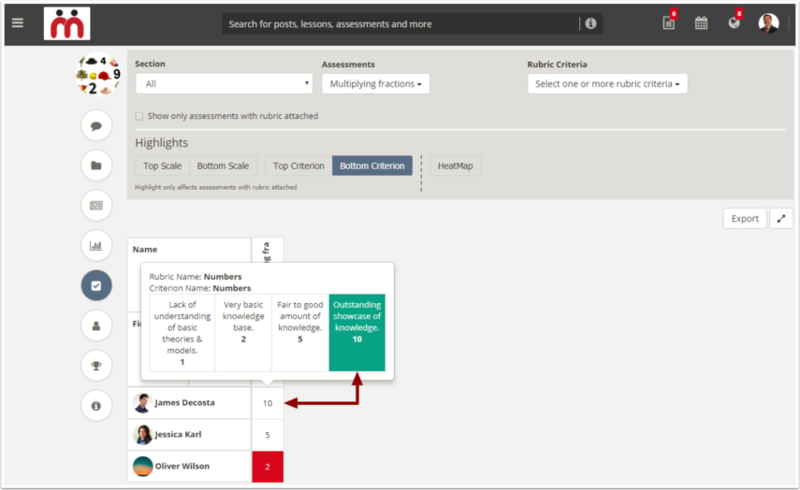 Clicking on +Add Score will open up the rubric popover showing the rubric criterion and scale for the selected offline test. 4. 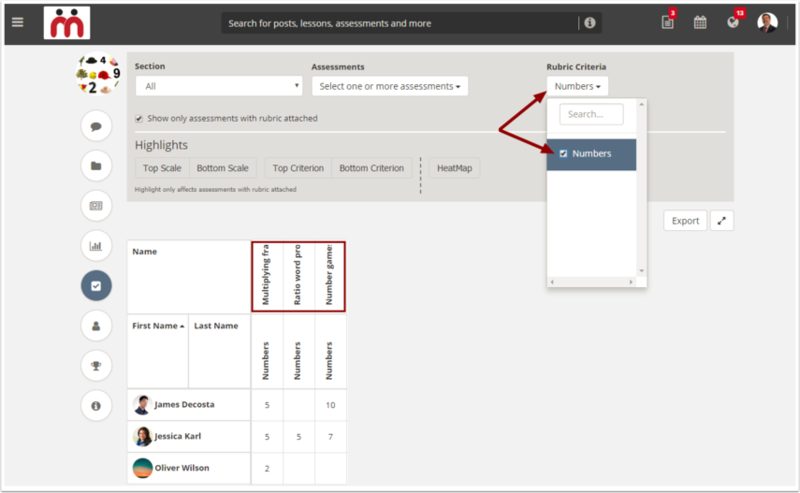 Select the appropriate scale from the popover and the moment you select a scale, corresponding point of that scale gets updated in the Points column. 5. Once you are done grading, click Save to save the scores, else click Cancel to abort. 6. 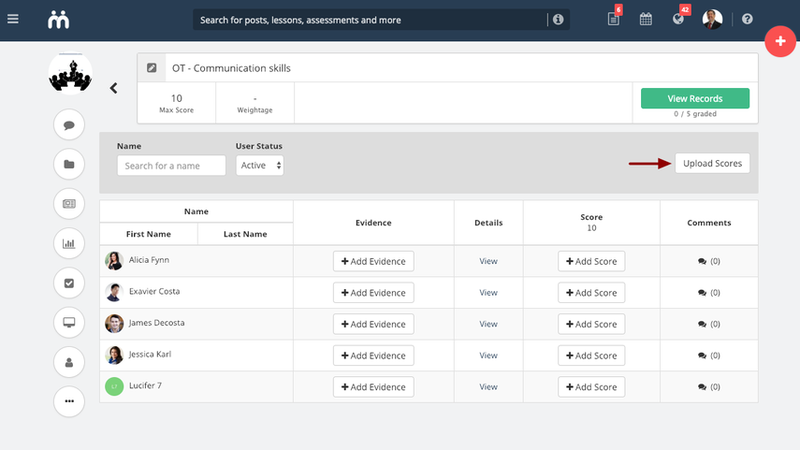 Learner's score will be updated and shown on the View Records page for that learner. Click the pencil icon to change the scales, if required. 7. Repeat step 2 to 6 to grade remaining learners. For an offline test with no rubric attached, you can simply click the Score cell, enter the score and press enter. 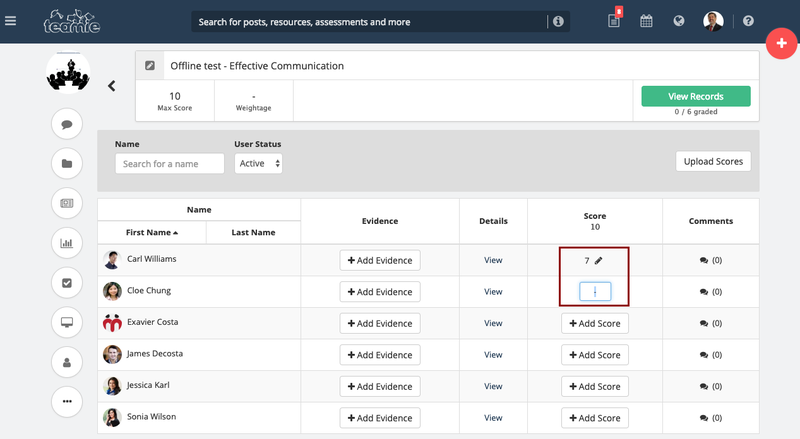 Entering the score and clicking "tab" instead of "Enter" will move the cursor directly to the next learner cell for that offline test. This will help you quickly grade learners by just using the tab key on your keyboard. 1. 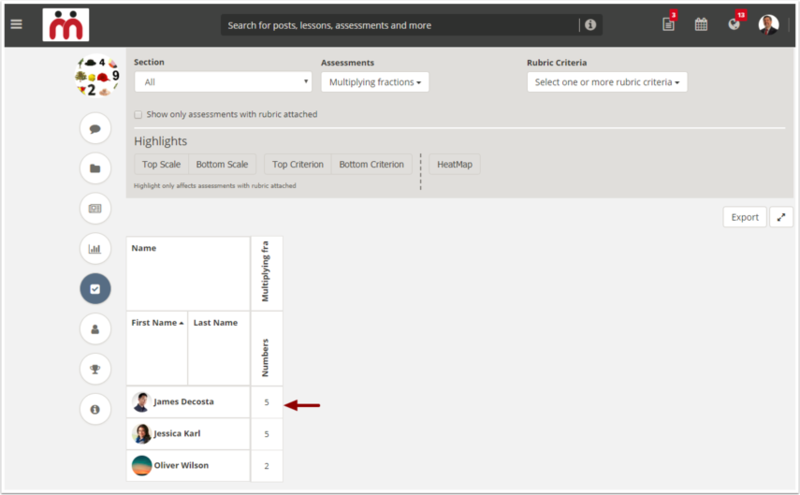 Once you have assign scores and graded an offline test, click the Gradebook tab to access that classroom's gradebook. 2. 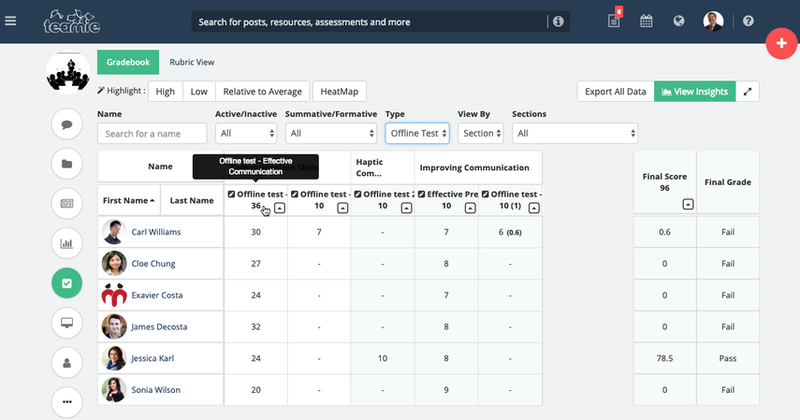 Click Type and select Offline Test from the resulting drop-down to quickly filter all the offline tests in the classroom. 3. Hover over an assessment's title header to view its full name. 4. Click the up arrow for the required offline test and select Publish All from the resulting drop-down..
5. The scores will be published for the learners and the column will be highlighted with a different color to distinguish from the assessments with unpublished scores. 6. However, it might not be clear to some users what this highlight actually indicates. Therefore, we have added an indicator for this on the corresponding cells. 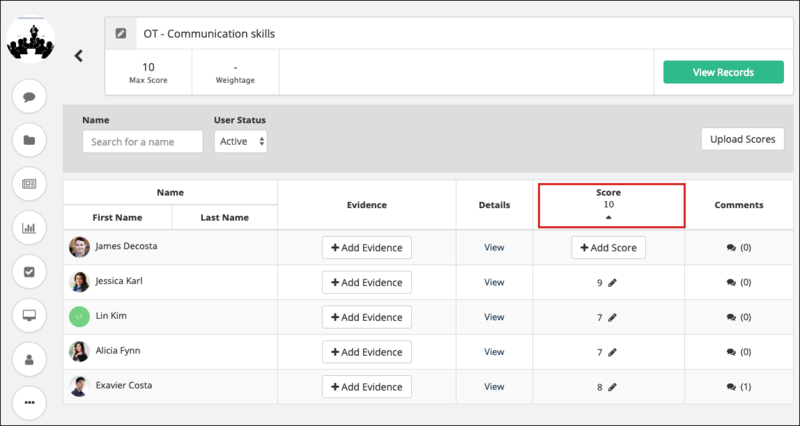 This indicator is in the form of an icon that will be visible once a user hovers over a cell with published score. 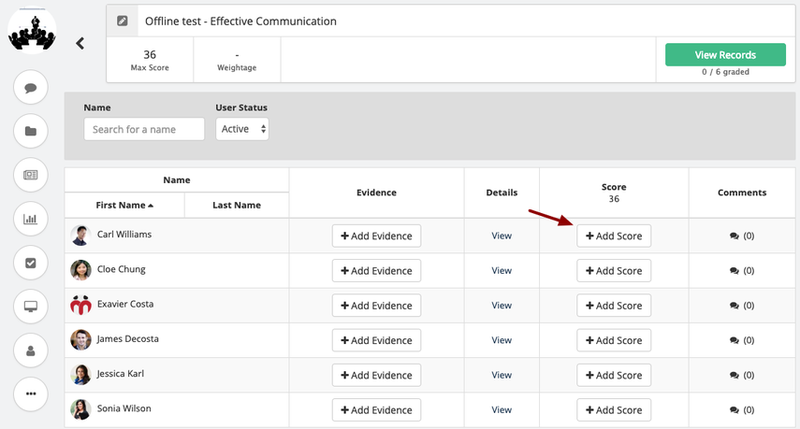 A tooltip will assist users in viewing the details of this highlight. This indicator will be present at the learner level in addition to the assessment level and final score level. 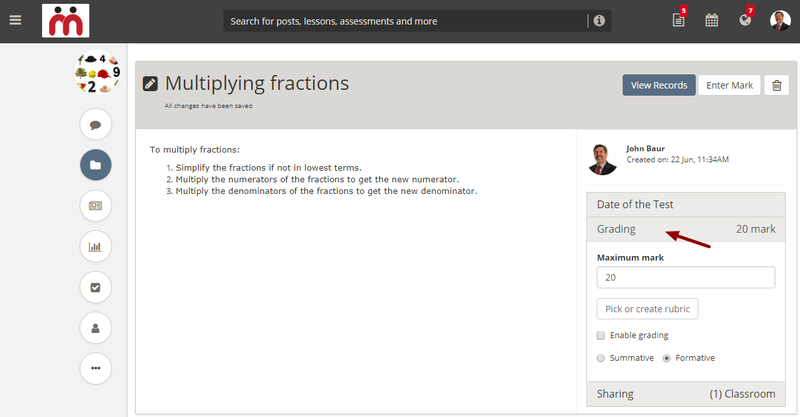 Learners will notified once the scores are published for the offline tests. 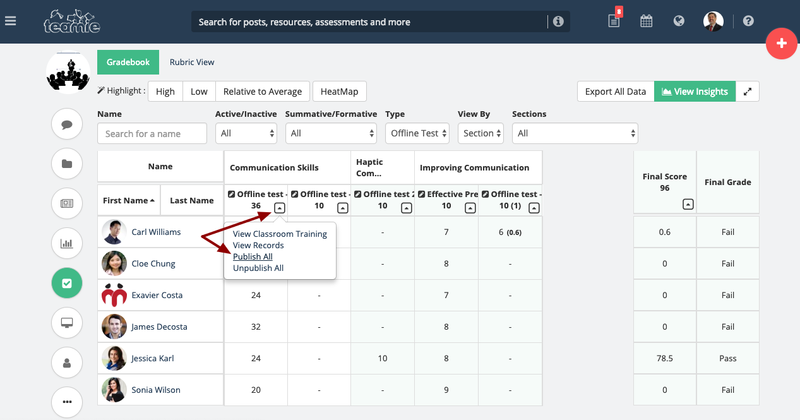 Instructors can now sort the View Records page of an offline test by First Name, Last Name and Score, making it easier and faster to view the intended learners records. 1. 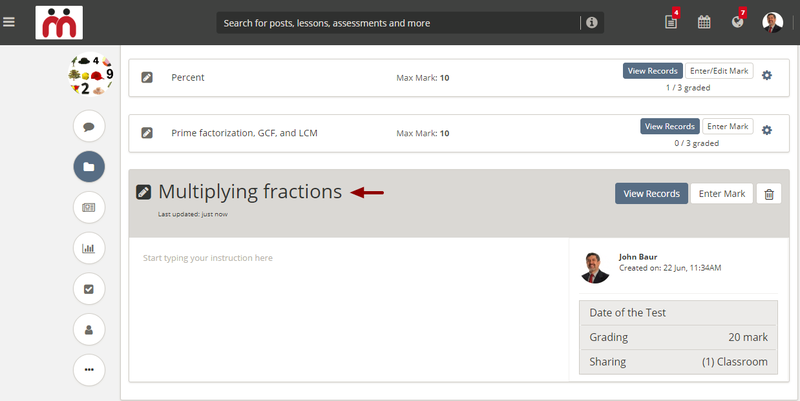 On the classroom's gradebook page, click the Rubric View tab. 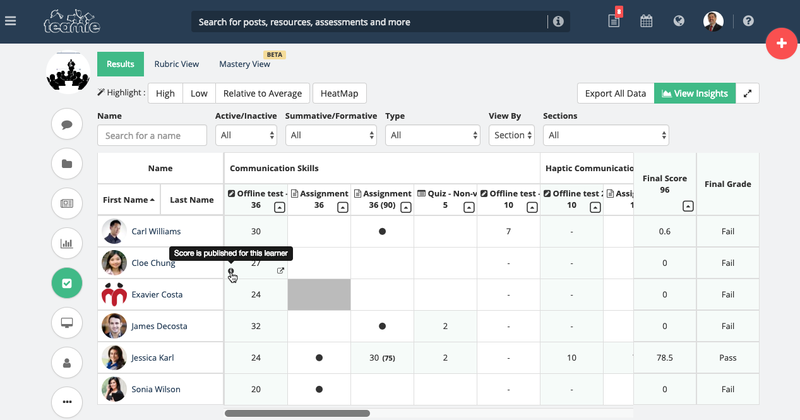 You will see a dash (-) for non-rubric assessments and hovering over the dash (-) column shows a label as "No Rubric Attached". 2. 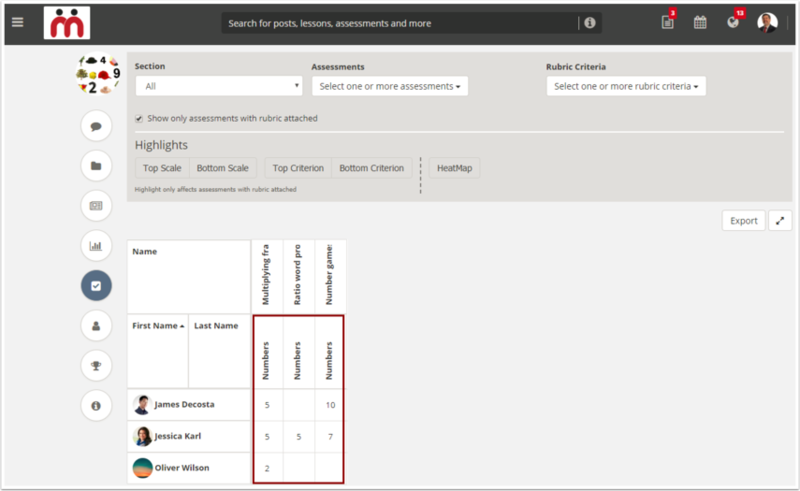 You will see all the classroom's assessments (only published assessments) on the Rubric View page. 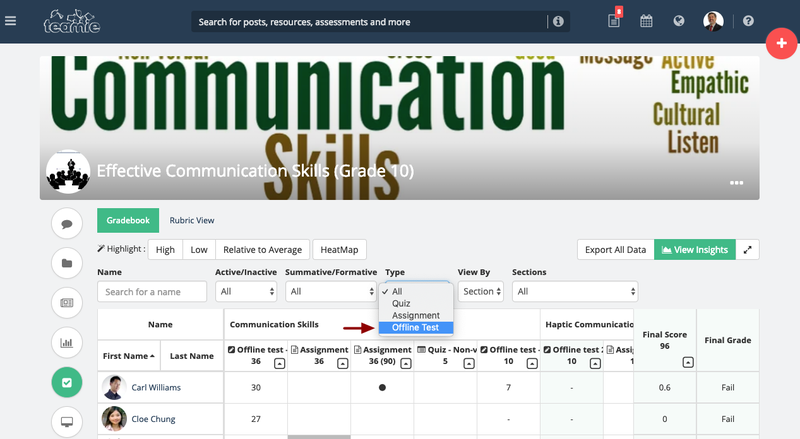 Click Show only assessments with rubric attached checkbox to see the list of rubric attached assessments. 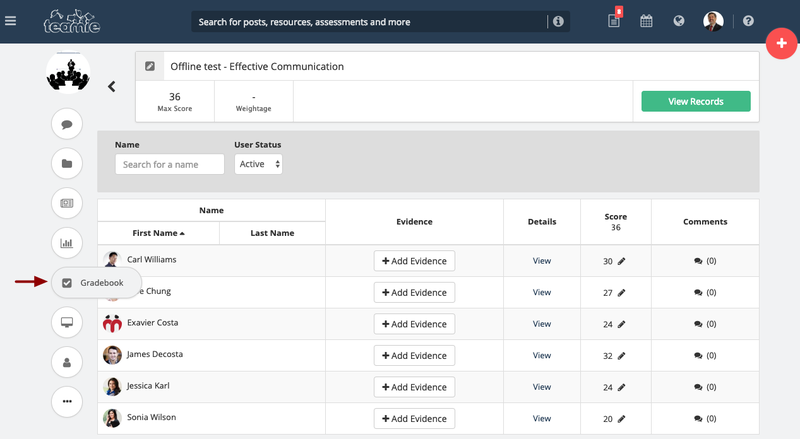 You can hover over an assessment title to see its full title. 3. 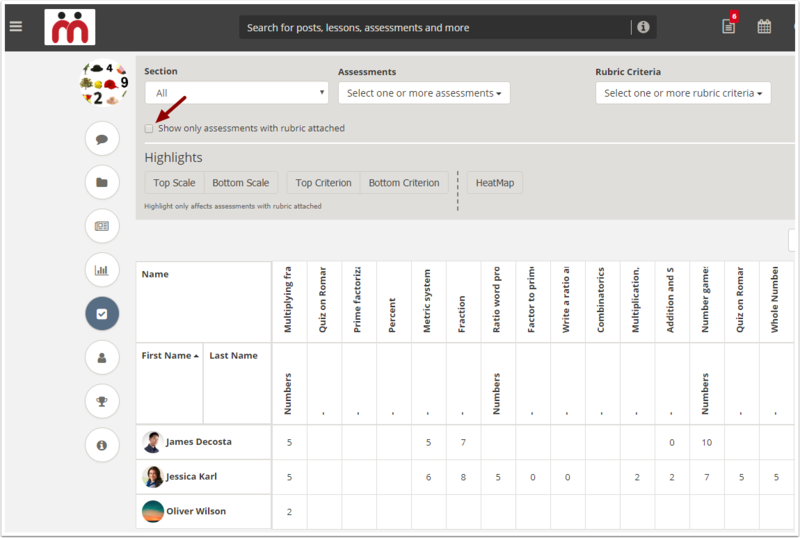 You can click Assessments drop-down and select the assessment you want to grade by ticking the corresponding checkbox. 4. Similarly, click Rubric Criteria drop-down and select the rubric by ticking the corresponding checkbox. 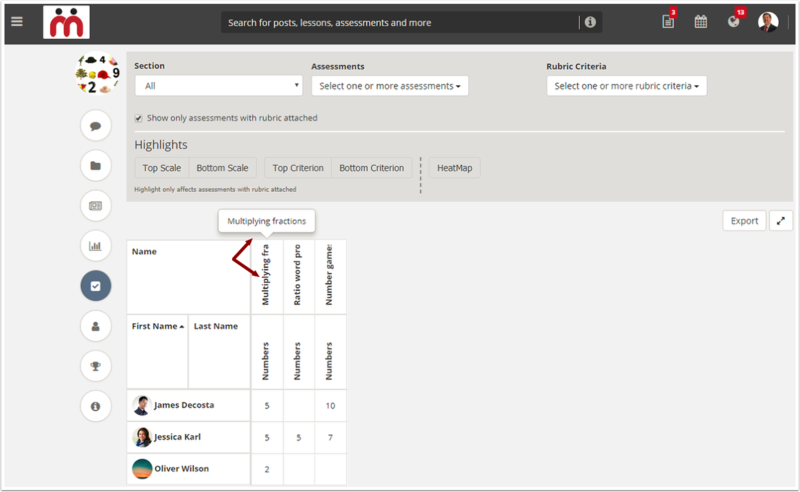 Once the filtering action is completed, you will see the list of assessments with that specific rubric attached. 5. 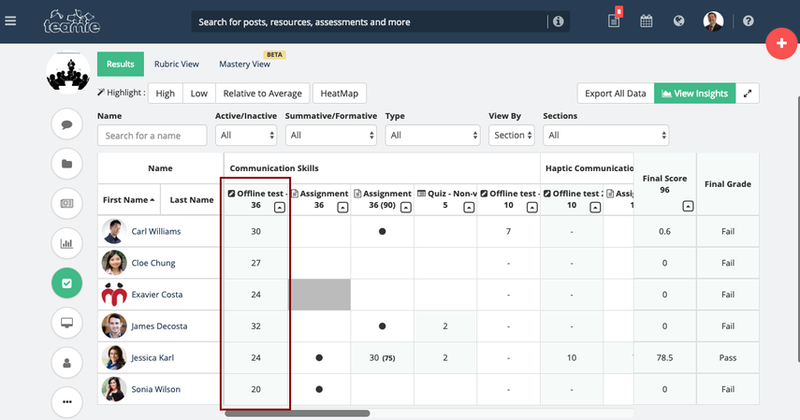 Click on the mark cell next to the learner name for a rubric enabled assessment. 6. 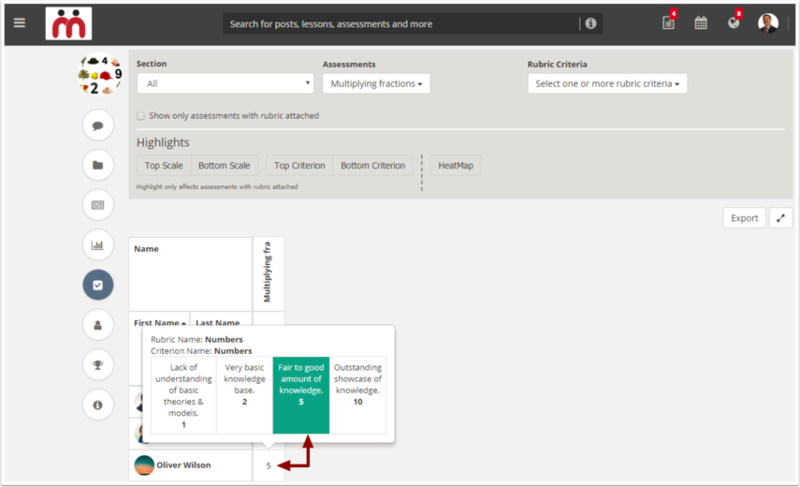 Clicking the mark cell will open up the rubric popover showing the rubric criterion and scales. Select the appropriate scale from the popover. The moment you select a scale, corresponding mark of that scale gets updated automatically. 7. Repeat step 5 & 6 to grade other learners. 9. 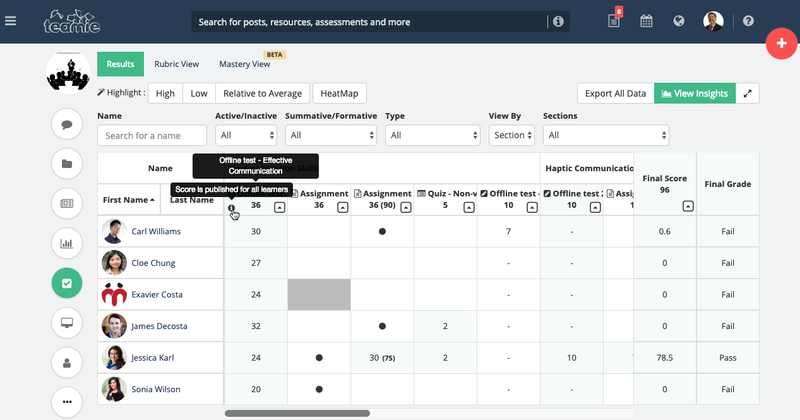 Once you are done grading all the learners, click Gradebook View tab. You will notice that the graded / updated marks are appearing for all the learners that have been graded. 1. Go to the classroom's materials page and click the gear icon of the required offline test title and select Delete Offline test option from the drop-down menu. 2. 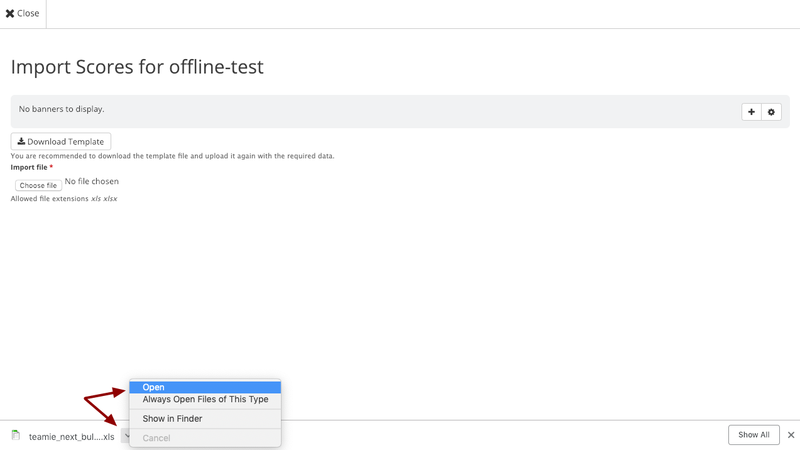 You can also delete an offline test from its expanded view by clicking the Delete icon. 3. Click Yes, Delete! to confirm the delete action. Please note, this action can not be undone and the deleted offline test cannot be recovered. 4. A confirm message appears stating that the offline test is deleted successfully. As an instructor, you can import scores for learners for an offline test quickly using a bulk import template. 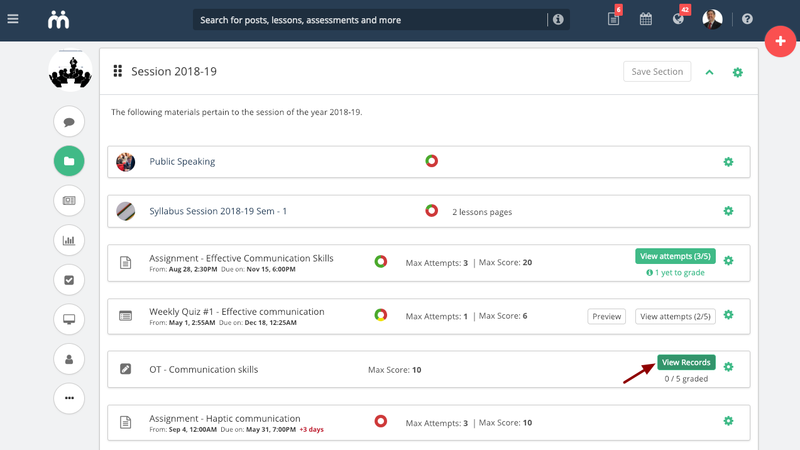 As offline tests are primarily used by instructors to capture scores and add evidence on learners behalf for activities performed outside Teamie, this process can take quite some time for instructors to enter scores individually for each learner. 2. 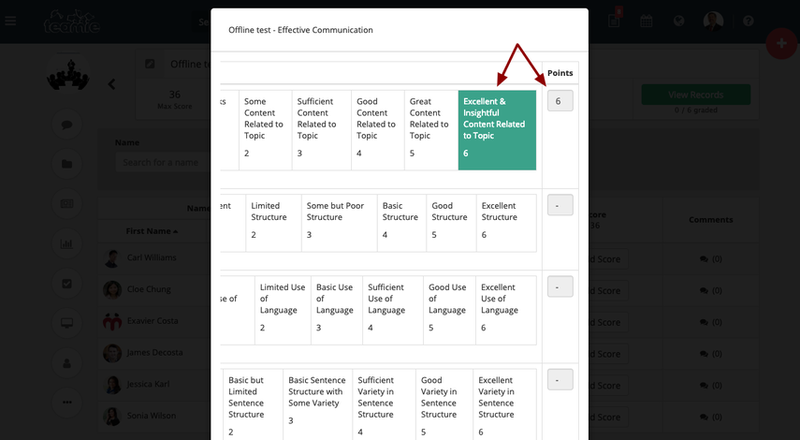 Click View Records of the offline test for which you wish to import learners' scores. 3. On the View Records page, click Upload Scores. 4. Click Download Template to download the excel bulk import template. 5. Once the bulk import excel sheet is downloaded, open it. 6. Enter the relevant details (username/email and score). 7. Save the excel sheet and upload it by clicking Choose file and selecting the excel sheet from your system. Then, click Import the Data Set. 8. 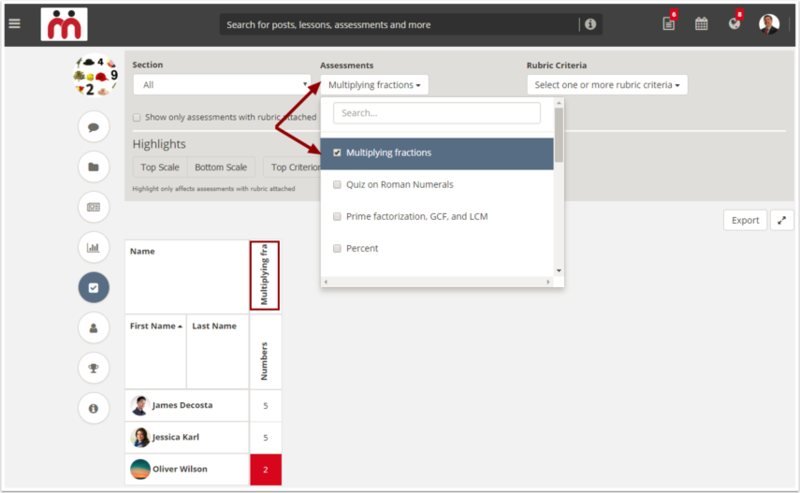 Once the import process is completed, you will be notified of all the learner' scores that are imported through the bulk import sheet. 9. Click Close to go back to the View Records page. 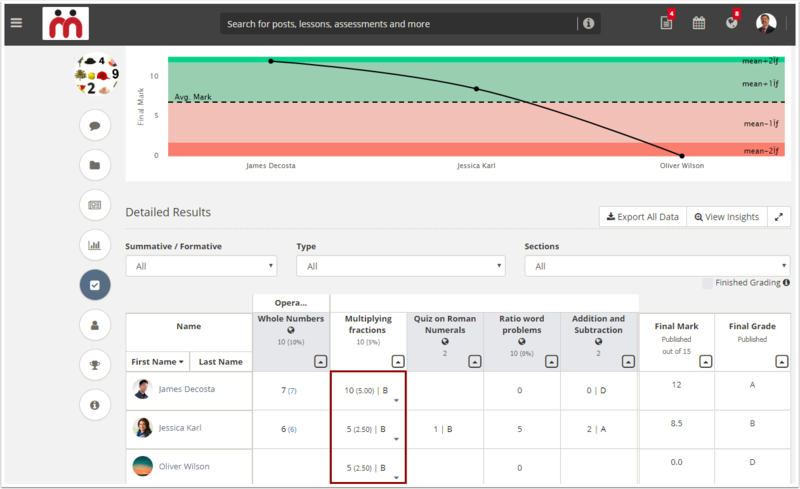 You will be able to view the imported learners' score there.